This recipe will always be special for me, because it was the first thing I cooked in our new stove. I needed to make something simple because the kitchen was still not completely functional: the central countertop was not yet there, the cabinets and pantry were still all empty. I actually made the prep work a couple of days earlier, as we were not sure when the stove would be installed. Every day that week we arrived home with fingers crossed, hoping that the big box with our Blue Star would no longer be sitting in the garage. Finally, on Friday, October 18th the box was gone, and our stove was waiting inside for us, in all its beautiful red glory! Two exact months since the beginning of our kitchen hellnovation. Remember? Cut the tomatoes in half, and remove the seeds. 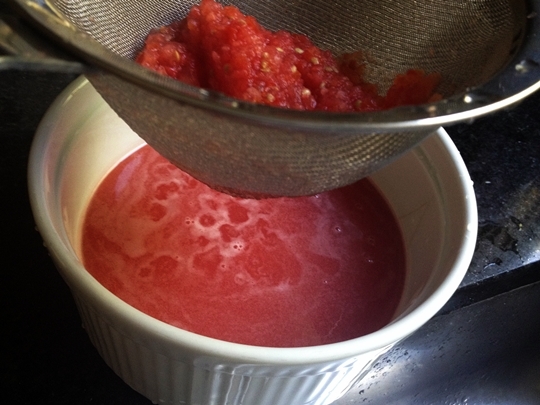 Add the tomatoes and 1 cup of broth to a blender and puree. Strain into a bowl and reserve the liquid. Add enough extra broth to make 2 cups of liquid.In a large saucepan, heat the oil over medium-high heat. Add the shallots, carrots, and celery pieces, and saute for about 4 minutes. Add the garlic and saute for 1 minute longer. Stir in the rice and cook until slightly toasted, stirring constantly. Add the tomato broth mixture, stir and bring to boil. Add the salt, bay leaf, and the Serrano chile. Reduce the heat, cover and simmer until the rice is tender, about 20 minutes. Remove the pan from heat. Scatter the peas over the top of the rice, cover, and let the rice stand 5 minutes. Fluff the rice with a fork, transfer to a serving bowl and serve. As Marcela mentioned in her show, the Serrano pepper sitting on top of the rice is a real delicacy. Offer it to your guest of honor, or if you are having dinner with your partner, fight hard for it, cut it in half so that you can both enjoy it. Phil’s remark at the end of the meal: “This was the best Mexican rice I’ve ever had!“. Before I leave you, here is a link to Blue Star site, where you can dream about and customize your own Supernova stove…. The rice looks wonderful and I’m almost as pleased as you at the performance of the new Blue Star. At first glance, I thought the Seranno pepper was a mussel and was very puzzled, as you might imagine! I grew up on what was called “red rice” which was good, too. The rice does look to be cooked to perfection. Now I want rice and mussels, with a Seranno just for me…. rice and mussels sound great to me too! Mmm…the best Mexican rice says Phil…then I must try! But would you mind my stopping by and using your new stove??? Mexican rice is so satisfying. And yours looks delicious. Looks so tasty! And hooray for new kitchens! Sally, I’m intrigued by the shape of your cooking pot – it is a tomato? The Mexican rice I make uses Sazon seasoning and gets its red-orange colour from achiote. I should try tomato juice combined with chicken stock next time and save myself some extra work while adding extra flavour. YES for your functional stovetop/oven! Thankfully I’ve never had an electric stove (and never plan on it) but I can see it being a challenge for rice cooking!! Don’t you love my new baby????? I am in awe still, I look at it and my heart misses a beat. Of pure joy! 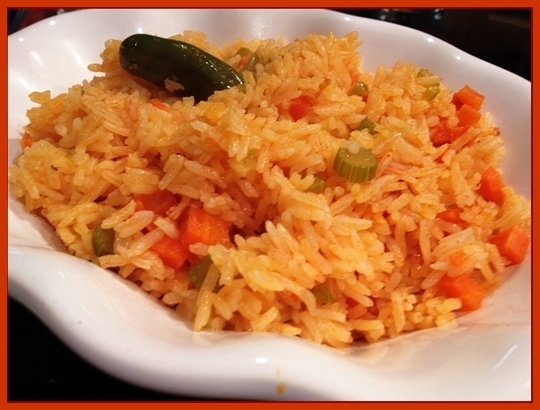 The picture of your rice dish is one of perfection, great photo and delicious looking Mexican Rice! And of course, it goes without saying the stove is superb and well deserving of your nickname for it! Supernova! I know you are happy to be cooking on gas! Electric is so challenging! Enjoy! We love making Mexican rice. And I LOVE your recipe. Simple sometimes is best… I tell you, we’ve been so busy that I look at a recipe that takes more than 20 minutes to prepare and I feel I cannot gather the energy for it… but that too shall pass, and I’ll go back to indulging in more elaborate cooking on weekends. Oh my gosh, I love Mexican rice. Though it looks pretty easy, it is actually lots of work. But, I wouldn’t mind doing it because I know it will taste so good. Thanks for sharing the recipe Sally! You are the best!